Right now my daughter loves quarters. She loves to take her wallet to the grocery store and buy little trinkets or gum balls at the row of quarter machines they have.I wanted to give her a way to earn quarters rather than just give them to her, so now every time she reads one of her BOB books she gets a quarter. The reading is slow going so she has a hard time sticking with it long enough to finish a book. This is just the incentive she needs. She has so much fun with quarters, I picked up a 50 state quarter collection holder at Hobby Lobby. Now as we come across quarters we check the back to see if it's a state we can add to our collection. 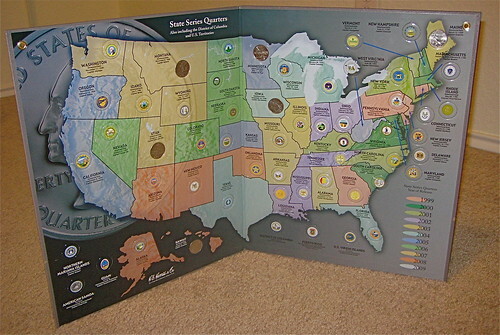 The U.S. Mint has lesson plans to go along with each state's quarter that are divided up by age group. We enjoyed coloring the enlarged picture on the back of the quarter and talking about what the picture means. How do you make geography fun? why didn't I think about the mint lessons? Thank you for this great idea!